Bran muffins are a delicious and healthy way to start every day! The subtly sweet flavors of molasses and raisins add a hearty and zesty kick to the otherwise healthy morning-time snack. Enjoy a batch for breakfast served with butter and a cup of coffee, or as a mid-day snack for a healthy and delicious pick-me-up. 1. Preheat oven to 350 degrees F. Grease muffin tin and set aside. 2. In large bowl combine bran, flour, cornmeal, baking powder and salt. 3. In another bowl combine milk, raisins, and molasses. Add to dry ingredients and combine until just moistened. 4. Fill greased muffin tins 2/3 of the way full. 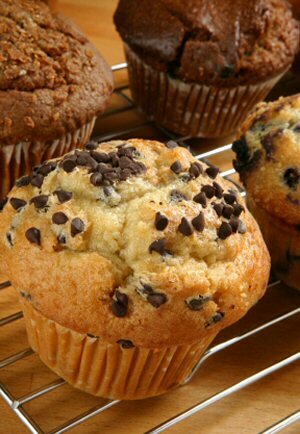 Bake for 20-25 minutes or until cooked through and a toothpick inserted into the center of a muffin comes out clean.